I thought today would be a good opportunity to go into a little more detail about how I put together the inexpensive plate wall in the dining room that has become such a focal point in there. It’s Thrifty Style Team day again! I’m starting to really look forward to these days and I love seeing what everyone else on the team comes up with each month. One thing is for sure: As I get older and I have more of a budget to put towards home decor, I actually find myself appreciating clever and budget-friendly decor solutions even more. Isn’t it funny how that works? I was pretty inspired last month by some of the thrifty dish-themed posts put together by some of the other bloggers, so I thought today would be a good chance for me to go into a little more detail about how I put together my inexpensive plate wall in the dining room. First of all, I have to say that this project was pretty clever, even from the very beginning. I actually used 4 IKEA picture ledges to create this wall. They were super affordable and even easier to put up. As you can see this idea is also super effective and allows me to change the plates out whenever the mood strikes! If you remember seeing this wall way back when I first installed it, you may have noticed that the concept was basically the same, but it wasn’t nearly as eye-catching as it is now. Adding in all kinds of interesting and colourful plates, along with a few other objects really brought it to life. This particular version features my blue and white collection and some Eastery goodness as well. The cream coloured plates that serve as the foundation of this wall are Pottery Barn Emma dinner plates. Not exactly the most budget-friendly option, but considering how much use I’ve gotten out of them over the years and the fact that I reuse them over and over again, not bad. I’d recommend the IKEA Are plates as an affordable alternative to these ones. The blue and white plates that you see are all thrift store or garage sale finds, mostly from quite a few years ago. When I’ve been lucky enough to find little saucers like the ones you see here lately, they’ve been around $5, but I only paid about 50 cents for them. Some of the more interesting, modern-ish looking plates that I added in keep the whole look from being too old-fashioned. I found them a few months ago at the Habitat for Humanity ReStore for $1 each. They don’t usually have dishes there, but you just never know what you’ll find! The light blue plates are ones that I’ve brought out for the spring/Easter season. The round ones nestled in behind came from my grocery store a few years ago and I think they were about $1.44 each. Sometimes when you find a deal like that, it just pays to grab them and hold on to them until a good opportunity to use them arises! Of course, having lots of interesting plates on your plate wall is a great thing, but if you really want to bring the whole look to life, adding a few other items really works quite well. I’ve added in a few little bowls that are part of my blue and white collection and they fill in the gaps quite well. Some of the bowls were found at thrift stores and some were found at kind of a Japanese dollar store a few years ago. They weren’t really a dollar, I think the were about $4 each, but still a great deal! My thrifty blue and white collection is actually getting so big that’s it’s started to take over other parts of the dining room. And I don’t mind one bit. When I add everything up, all of the blue and white items on this wall including plates, bowls, and vases cost me less than $30 total! If I were to use more basic white plates as a backdrop, this whole eye-catching wall could easily be pulled together for under $100! Not too shabby! Do you decorate with plates and dishes around your house? I’ve always been drawn to them when I’ve visited thrift stores and garage sales so I’m happy to have a place to display them in our dining room! Make sure you follow these links below and check out all of the other thrift decor ideas for this month! Love all of these super creative projects! Such a great group of talented people! Can’t wait to see what everyone comes up with next month! This is such a great idea. I have way too many dishes stored away and using them as part of your decor never really occurred to me. Especially on a whole wall. I love it! 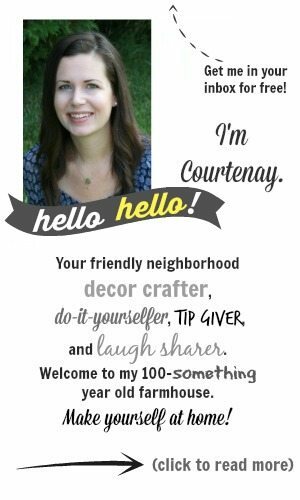 Hi Courtenay! We too are big fans of blue and white decor! Love your plate collection and styling of the shelves. It all looks so beautiful. Thanks so much, Vicki and Jenn! It’s been so fun linking up with you! I always forgot who I leave comments for that I smash plates for mosaics. I promise though I have never broken any of that kind of vintage blue patterned plate! Pinned. Courtenay, your plate wall is beautiful. I love the idea of using the Ikea ledges. I honestly never would have thought of that, but now, I’m trying to figure out where I could do something like this in my house. The blue and white plates are a favorite of mine. When I was growing up my mother had an old set of these and they always spart good memories in me. Thanks for the thrifty inspiration! These IKEA ledges really are magic. I’ve used them in quite a few places around the house, but this one is definitely my favourite! I have been collecting plates for awhile. I just love your idea and style. I think I might need to implement this into our new home. Thanks for sharing. That looks beautiful, I love the shelves! The blue looks so pretty! This plate wall is STUNNING, Courtenay! Wow! I am in LOVE with the colors! It’s always so fun linking up with you! what a gorgeous display of your blue and white plates Coutenay! I love, love, love your plate wall! You’ve given me an idea for something that I can do in our hallway. I just wish IKEA was closer, though.